Today the Dodgers and Cubs had a workout at Dodger Stadium. Click here to see this Jewish Baseball All-Star team compiled by Adam W. Green. Video Time! Happy New Years to all the Jewish community, check this out. Shalom! Nomar delivers walk-off Home Run. Joe Beimel talks to am 570 (8-12-08) Great interview. 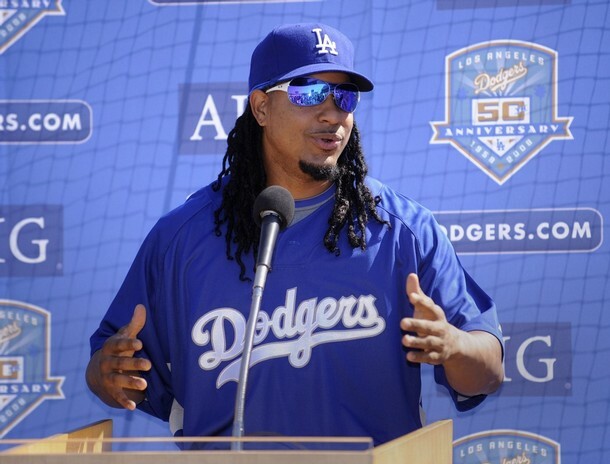 Alyssa blogs about a way to sign Manny Ramirez for next season. I don’t think it works out. She writes the following…. Let’s say the Dodgers average 48,000 fans for the remaining 20 home games, and everyone puts $10 into the “Keep Manny In L.A. Fund.” That’s $480,000 a game and $9.6 million total. Add that to the $50 million in other contracts that will come off the books, and you have 59.6 million. That means the McCourts only would have to come up with another $40.4 million to reach the $100 million contract Manny most likely is seeking. Piece of cake. 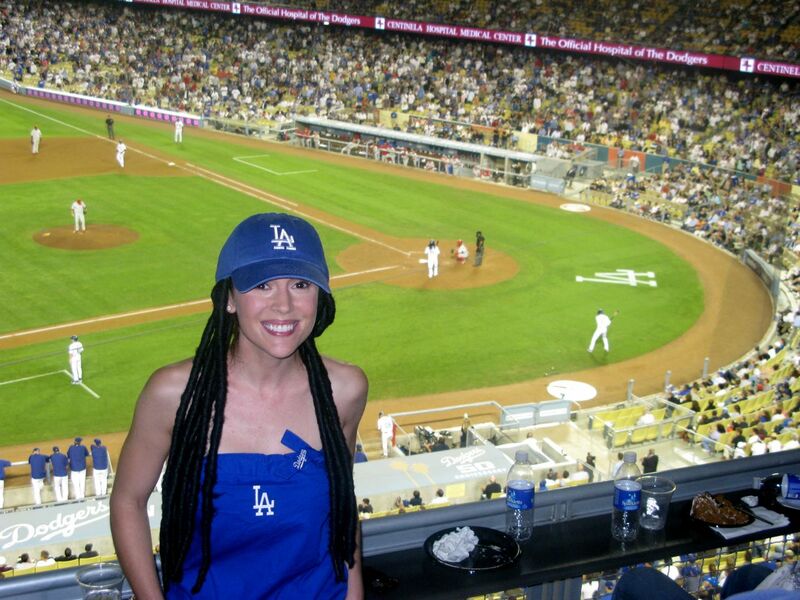 Well how about this for an idea Alyssa (Nice dreadlocks by the way) let Mr. McCourt pay the salary of Man-Ram. I agree that Manny changes the way Pitchers handle the other hitters. We need Manny. But at what cost ? We don’t know what his motives are. What if he asks for 5 years ? I wouldn’t give it to him. Remember, he is 36 years old. The maximum I would give is a 2 year contract. I see him playing for the New York Yankees in the next few years. Video Time ! No More = One More ! Nomar does it ! What a win last night ! This is a joke, right ? Nomar Garciaparra says that the reason he is taking long to come off the disabled list is because he has slow healing in his genes. Dodgers infielder Nomar Garciaparra said a genetic predisposition, one he didn’t know he had until it was identified by a Boston physical therapist with whom he voluntarily consulted last week, is the reason his left-calf strain has been so long in healing. So blaming his own DNA ? Wow….I wonder if he got hurt yesterday while holding his annual Carne Asada event ? Well according to another Dodger Blogger, Robert Daely, everything went well. Glad to know. I found a video from the local news from the event. I wasn’t able to upload it here so I posted on YouTube and post it here. I promise I won’t make fun of Nomar anymore. 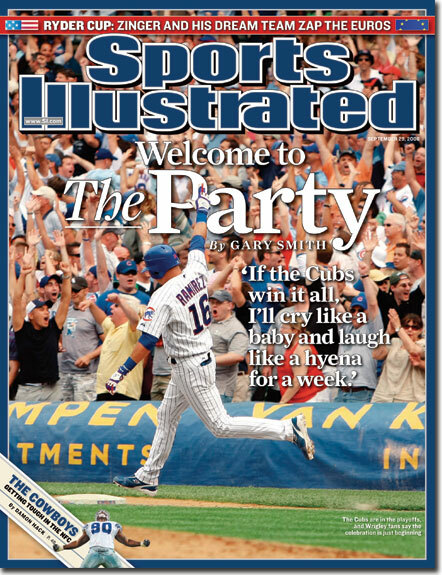 I hope he comes back and help us win this bad division. I mean, he can’t be worse than Mark Sweeney, right ? Nomar = No More ! I always enjoy reading Tony Jackson’s columns on the Daily News. I also enjoy his blog. I check it on a daily basis. The guy is smart and funny. Doesn’t take it too serious and always has a story to tell us. But when I read this, I laughed so hard. Check out what Tony wrote on his blog…. When he woke up this morning, something “didn’t feel right,” according to Joe Torre. Well, of course it didn’t. Nomar went 1 for 2 with a home run in his debut for Triple-A Las Vegas last night against Tacoma. Stan Conte talked to him today and said Nomar felt confident he would be ready to play by Friday, which I guess means he’s out for tomorrow, too. “which I guess he’s out for tomorrow, too” lol That was funny. But I do agree with Tony. My opinion on Nomar is that he is done. This being the last year of his contract with the Dodgers, you might have to say goodbye forever. 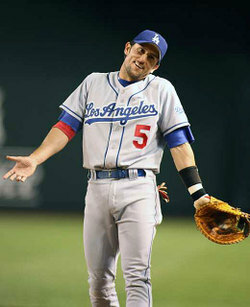 We all know the Dodgers will not bring him back next year. The latest news is that he is in Boston to get checked out by a Doctor he knows when he played with the Red Sox. No word on how it might affect Carne Asada Sunday. I guess he doesn’t trust Stan Conte and the Dodgers medical staff. So all I have to say is…No more ! guys like Blake DeWitt and Andy LaRoche. 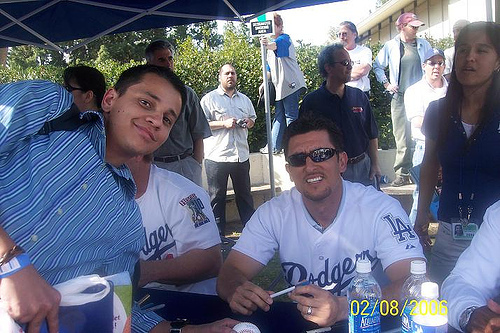 On the right…pix of Nomar and I from a couple of years ago.